“Check this out, crikey it’s a spotted Cus Cus. The most beautiful marsupial in the world”. This is a catch phrase that many people would recognise as the instantly distinguishable Steve Irwin. The crocodile hunting, snake grabbing, turtle catching extraordinaire. This man has more enthusiasm than Jim Carrey on ecstasy. Steve, as always in the series, has awe-inspiring interest unmatched by any narrator or entertainer in the documentary field. Just to inform you if you have not been familiarised with the previous reviews on Crocodile Hunter. Steve Irwin and his wife Terri run the Australia Zoo in Queensland. Steve has an incredible passion for wildlife and in the first episode (Jungle in the clouds) we see Steve travel to Papua New Guinea, where he sets off to find the most intriguing animals in nature. Here he finds goannas, geckos, tree kangaroos, snakes, crocodiles and all manner of creatures. Each creature he sees he picks up, dangerous or placid and then discusses all the facets in detail to the audience. After meeting the Komoro tribe, Steve travels around PNG in a wooden dugout canoe, north of the Arafura sea, through mangroves and mosquito infested jungles to some of the highest peaks in the world. Along his way, Steve finds an assortment of animals that he picks up and discusses at length using his abundant knowledge of zoology. Because Steve has his study roots set firmly at the zoo, there is never a shortage of information to be shared. This one is definitely for the whole family too, as everything is discussed in simple language and is easy to understand. There is also a lot of good humour as well, like at the beginning of Episode one when he says while floating in a canoe with two tribesman “That traditional head-gear the tribesman are wearing is cassowary feathers, my traditional head-gear I am wearing is …a cap” There are many examples of this and makes for an entertaining watch, even for adults. The most curious part of Jungle in the clouds, would have to be when Steve goes into the jungle with a tribe member and searches for Tree Kangaroos, or Cus Cus as they are referred to in the tribes. He cordially asks the bush man to remove his traditional head dress and place on a head torch. They both start looking for the nocturnal creature and find several of them high up in the trees. Steve feeds them some banana and they don’t take kindly to him being close to their food. The Cus Cus comically attacks Steve’s head with its little claws until Steve decides to leave the poor little fella alone. What never ceased to amaze was Steve’s sheer bravery when confronting poisonous creatures, such as snakes and goannas. What would be complete stupidity, if attempted by a Layman is done with style and finesse by Steve who uses his intuition to gauge the animal’s temperament. Although at times Steve approaches animals like he is a young boy, running to the tree on Christmas day. He is careful to not get bitten by these beasties. In one scene Steve picks up a tree snake swimming in the mangroves, which proceeds to bite him and he just casually shows the bite to the camera. In the next episode faces in the forest, Steve and Terri go to the forests of Sumatra to visit a halfway house for Orangutans. They go into a kind of rehabilitation centre for Orangutans that have been kidnapped from the wild. Here they teach them how to climb, make nests and what to eat. Then they are gradually, one step at a time, released into the wild. Once again we see Steve climbing the jungles like Tarzan and ignoring the dangers faced as we see many great panoramas of these amazing animals in the wild. In one interesting scene we see a mother and a baby “Orang” coming very close to Steve. In most circumstances, Orangs are very protective with their children and will become typically aggressive with strangers. Luckily for Steve in this scene, all the mother wanted to do was receive a bit of affection. This makes for probably the most poignant part of the second chapter. In one touching part Steve meets a very pregnant Orangutan he feeds her talks to her and just when the audience is in nervous anticipation for the inevitable birth. The narration comes in with Steve saying that the poor mama and her baby died not long after Steve and Terri left. This is a heart-wrenching reminder of how fragile this species is on this planet. Even in the wild. As Orangutans only come into cycle once every seven years so the window for reproduction is very small. So every chance to increase numbers is made with consummate care. Other parts in this chapter include meeting Mister Mischief who as the name implies is a mischievous little fella as well as many other Orangutans, land turtles and bee nests. All of this makes for interesting viewing especially for young children. 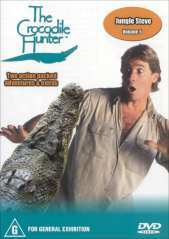 Crocodile Hunter has some educational aspects for young children as well. They learn about conservation, what animals eat and how they behave and just to realise how large and precious this world is. The sound is of a high standard and Steve and Terri speak clearly and there is never a time when the kids will be asking “what did he say?” every five minutes. The music is used to great effect and is used frequently to enhance mood in various parts of the film. There is a lot here to recommend to the whole family, especially the kids. The language aforementioned is concise and informative and Steve is never lacking in the odd gag. Steve’s manner in the way he conducts himself is entertaining and draws the viewer to listen to everything he has to say. I would recommend this generally to younger viewers with a keen interest in animals.